Vinyl Decal Basic Pricing Chart. This is very general pricing information for the vinyl decals, car stickes, family stickers, and vehicle / boat graphics. For specific info enter options on the product pages and price will appear, or feeol free to contact us anytime. Try to maintain your proportion. Don't Specify weird sizes like "I want the powered by deez nuts 5 inches tall by 12 inches long." This would stretch it way out of proportion. The option is yours. When ordering from our large decal catalog you can choose from our proportional size list or enter your own custom non-proportional size. These consist generally of size 6" x 12" Vinyl Decals or 8" x 8" Decals or smaller. Some decals can be made smaller but usually not smaller than 4" x 4". As a general rule, the higher the detail that the design possesses, the less chance it can be made smaller than a regular size decal. 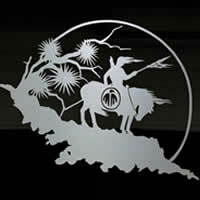 Let me know the decal size needed for bulk ordering, custom inquires, or order a custom decal online automatically. You must be clear on the size you want. Specify color. Starting at $4.99 each for regular size decals. Price calulated by the cart depending on the size and color you choose. See selection here. Order your decal online, choose options for price. Usually around 12" b12" or up to 20" x 10" in size or larger. Please specify size you want. Specify color. The smallest vinyl decal we can make, eg. for mini race cars, RC cars, etc is dependent largely on the amount of detail involved in the design. The largest decal we can make in one piece is 120" x 22"
Usually $12 - $20 and up depending on size and options chosen. See selection here. Order your decal online, choose options for price. Front windshield decals can range in size. We sell often: 36" to 40" long top window stickers. Please specify decal size needed.. A good size for a front window on most vehicles would be 40" x 5" which leaves some space on the sides in most cases. 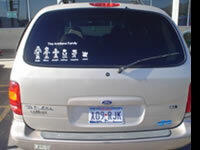 Vinyl decals are also great for back window or tailgate advertising in a 12" x 36". Specify color. 48" Decals usually aprox. $26.00 each. Pricing is general and aproximated. For specific price order online, choose options, and get price for those options. .Car Club Decals. Car Team Stickers. Racing Decals and More! 40" x 5-6" Decals Usually aprox. $20 to $30 depending on size and custom options you've selected. For specific price order online, choose options, and get price for those options. 24" Decal for side of window. Usually aprox. $15 each depending on size and custom options you've selected. Each color on these decals are die cut separately and pieced together by hand for a totally unique finished product you can buy anywhere else. See more examples - Click here! 12"-13" Decals usually aprox $20 to $30 each depending on size and custom options you've selected. 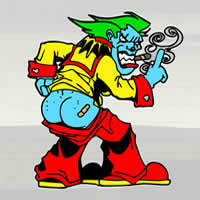 See the full color car decals here. Family Stickers for Car, Family Car Stickers, Family Decals you Customize! Family Stickers are a new way of expressing family pride. These are diecut vinyl decals that come in the color of your choice. Choose any family members you desire and even put names underneath. Optionally add a custom personalized family header above the decal. Create a family decal that lasts for years! Members cost from $3 to $5.50 each after 4 members are added. Ordering only 1-3 members costs a little extra. Vinyl car truck boat graphics come in sizes as small as 12x4 inches all the way up to 120x22 inches for larger applications. For more see our informative vehicle graphics page and order online automatically. Choose decal size, decal color, checkout. We ship daily. 2nd color (custom order--contact us first) aprox. 50% more. Example: A pair of 6 foot X 13 inch graphics would be $60 for the pair. Add a shadow of another color for $30. 22 " width - 14" width. For more details click on the link. Specify color. Second color 1/2 price. Example : Shadow of another color. 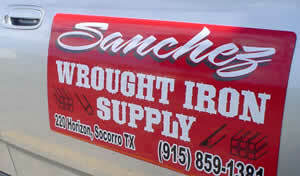 MAGNETIC SIGNS for business advertising. Arrive to that job with a professional look, and use the same vehicle for recreation. Easily remove or reapply, or leave the magnetic signs put for an excellent advertising opportunity. 12"x24" = $50 / pair (or 2 pairs for $90) FREE USA Shipping. Price can vary depending on specifics so please contact us if interested. We usually can create and ship same day. One for you and a few for your friends. Business Stickers. Pass them out. Cell Phone Cases and 1000's more uses! 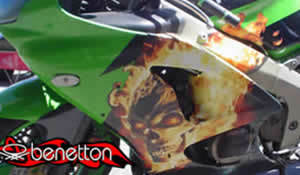 Quantity Decal Purchasing, Wholesale and Bulk Orders. Please feel free to ask me for a price quote. Decal pricing will vary from item to item and from job to job depending on : quantity purchased, color chosen, and complexity of the design. All orders are different. Example: 50 Regular size vinyl die cut decals would be aprox. $2 each. Example: 50 - 24" X3" Decals would be $4 each.